This EasyStep will guide you through creating your first program for the EC1 EasyOne. It creates a flashing LED. This may not seem like much, but it will show you some essential principles of SPLat programming, including MultiTrack (32 processes for the price of one!). It should take you between 1 and 2 hours to go through this. Before starting on this, please be sure to have completed the EasyStep Getting started with SPLat/PC. Have your EC1 all hooked up via USB, and SPLat/PC running. Now locate the Edit window of SPLat/PC. You are going to be typing your first program into that window, and then you are going to get the EC1 to run the program. Here's what the Edit window looks like, with the first line of the program typed in. In brief, a program for an EC1 consists of a series of instructions that have been typed into the Edit window using the specific language of SPLat controllers. These instructions tell the board (in your case, the EC1) what steps to take to perform whatever function you want. The EC1 has a limited repertoire of instructions. You can only use those instructions it can understand, and you have to use them with exactly the correct spelling and in exactly the correct format. Think of the EC1 as an incredibly dumb, unbelievably literal, but amazingly fast. Here is the program. Before you type it in, move your mouse over each line in turn, starting from the top, and study the pop-up descriptions. This line has 3 elements. The first, Loop is the line label. It simply gives the line a label that can be referred to elsewhere in the program — more on that later. The second, ON, is an instruction, using the keyword "ON" (sometimes called a mnemonic) to tell the EC1 to do something. In this case the "something" it is to do is to turn ON an output. The third element is the number 0. This is the "argument" that goes with the ON instruction — it tells the EC1 which output to turn ON, namely output number 0, which on the EC1 happens to connect to a green LED on the board. When you type in this line, make very sure that the line label "Loop" starts to the far left (in column 1). Line labels MUST start in column 1! This instructs the EC1 to simply Pause for 5 time units. The unit of time used is 10mS (one 100th of a second) So Pause 5 will mean nothing more is done for 50mS (a 20th of a second). But, because the previous instruction turned ON output 0, the LED will be shining during that time. You can probably work this out for yourself: This OFF instruction makes the EC1 turn off output 0, which will turn OFF the LED. This one you can work out for your self. What will the LED be doing during this interval? The GoTo instruction makes the EC1 jump to the line with the label "Loop". That little statement embodies one of the most profound concepts in programming, that of having a program that can repeat a series of instructions in a loop. 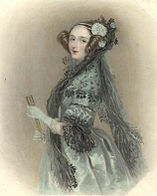 The idea is credited to Lady Ada Lovelace (1815 - 1852). This GoTo is unconditional — the EC1 must obey it. Even more powerful are a whole series of conditional GoTo's, which allow the program to go one way or another depending on the result of a test of an input or of some internal data. A program can change its behaviour depending on previous events or current conditions. Before we go on, a little word of comfort: So long as you do not connect the wrong voltages to the EC1, or short circuit the wrong pins, you cannot damage the board or your computer. Programming the EC1 from your PC, powering it via the USB cable, can never do any harm. So even if any of the steps that follow don't give the expected result, you won't break anything. You may wonder why it refers to "Module". That's what we called them back in the early days of SPLat. These days we prefer to use the term board, but we haven't changed the terminology in SPLat/PC. If you get an error message of some kind, double check all your typing. Does the "Loop" label start in column one? Are the key words spelled correctly? So, follow the suggestion in the window, and click the Run button in the Module window. Click the Stop button on the Module window to stop the program and give control of the board back to SPLat/PC. Congratulations, you have just achieved the following. Learned four out of the 14 instructions in the SPLat FastTrack instruction set. FastTrack could be just about all you ever need to write basic programs in SPLat. Of course, SPLat has a lot more than 14 instructions. We stopped counting at 450. But the nice thing is that you can get an observable result with just 4 instructions and 5 lines of code. As you have seen, you can get a result quickly, but the depth and scope of the SPLat instruction repertoire means you can grow into it gradually as you gain understanding, experience and ambition. Next: Take a break. Stretch your legs. Have a cup of your favourite beverage — but keep a clear head, because you ain't seen nothing yet! Come back in 10 minutes! In 25 words or less, describe what is difficult about this. If you get more than one word, please write to us. If you try to run the above code, what will happen? Well, when it gets down to the line GoTo RedFlash it will jump back up to the line labelled RedFlash. The GreenFlash stuff won't get a look-in. Try it if you don't believe me! This line places the line labelled RedFlash into a list of tasks. A task is a section of program that will run independently of anything else. It is almost as if there was a separate processor dedicated to running that task (except that it must share available resources (memory, etc.) with all other running tasks). This does the same for GreenFlash as the line above did for RedFlash. After this line has been executed by the EC1, there will be two tasks waiting to be run. This starts the list of waiting tasks running. Because we placed two tasks in the Task Queue those two tasks, RedFlash and GreenFlash will start executing in parallel with each other. Can you see how adding just the two instructions LaunchTask and RunTasksForever to your repertoire allows you to make the EC1 do several things at once? In fact it can do 32 things at once — 32 processes for the price of one! News flash: EC1 now supports 64 simultaneous tasks! Translate the program and run it in your EC1. The two LEDs will flash, but at slightly different rates. The visual effect is that they slip in and out of synchronisation with each other.